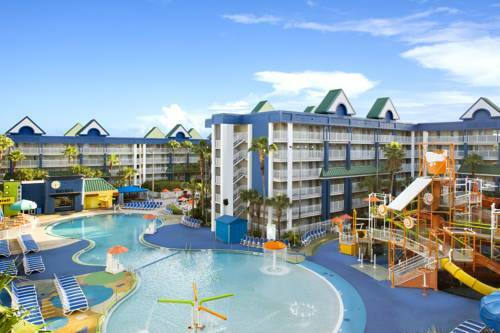 Enjoy the only All-Suite Holiday Inn Resort in Orlando, Florida at the entrance to the WALT DISNEY WORLD Resort The Holiday Inn Resort Orlando Suites - Waterpark in Lake Buena Vista completes a $30 million top-to-bottom rebuild in 2016 and is located in the heart of Orlando on 24 acres, 1 mile from the Walt Disney World Resort theme parks. The resort is also near Universal Studios and Islands of Adventure featuring The Wizarding World of Harry Potter, CityWalk, SeaWorld, Aquatica, Discovery Cove and the I-Drive entertainment district featuring I-Drive 360, home of the Orlando Eye and Orange County Convention Center. Our location is easily accessible to shopping at both Orlando Premium Outlets and The Mall at Millenia. Our newly remodeled Orlando family resort features 777 spacious suites with choice amenities, including free high-speed internet access, microwave, mini-fridge, 42" HDTVs and Bath & Body Works bath amenities, water park with slides and flumes alongside cozy cabanas and poolside bar. At our Orlando resort each family member can enjoy the 4-D Experience, Batman Laser Challenge, poolside entertainment and 3,000 SF Arcade. The resorts Marketplace is the hub of shopping, dining and entertainment with its convenience store, souvenir shop, restaurant, food court and bar. It's also your jumping-off spot for all major Orlando area attractions with our convenient complimentary scheduled shuttle service. A favorite stop for our guests in the Marketplace is Antonio's Pizzeria. Our team cooks up freshly fired, hand tossed pizzas made before your eyes, strombolis, burgers from the grill, chicken nuggets, french fries and pizza by the slice! The Marketplace Food Court also features Stackers Deli, serving sandwiches and salads and all the latest creations served fresh and fast by the staff of expert sandwich artists. The Hideaway Lounge, located in the Marketplace, is the perfect place for adults to relax, catch a game on one of several TV's, enjoy your favorite drink and grab a quick bite. The Buena Vista Room is a great space for holiday parties, family reunions, team-building, weddings, and more! The maximum capicty for the Buena Vista room is 654. Our resort makes it easy to meet and connect, offering the perfect combination of comfort and convenience for teambuilding trips, relaxing executive retreats and casual meetings. Our meeting venues provide state-of-the-art technology and catering. Children's program - Get creative and make a craft at our craft station on the pool deck. Offered on select days and charges apply. Falcon's Fire is an 18 hole, public course located at Kissimmee. Set out for a day of fun with the whole family, that combines science, technology, history, and culture with the wonderment and innovation of Disney's imagineers. See the magic of Disney come to life and experience thrilling rides and attractions, roller coasters, and fabulous live action shows with your favorite characters. Go behind the scenes and see your favorite movies come to life at this Hollywood-themed attraction, celebrating classics like Star Wars and the Muppets. Witness the magic of nature up-close as you encounter more than 300 different species of rare animals, throughout six distinctly themed habitats. Explore themed islands to enjoy thrilling rides and coasters, eye-popping shows and interactive attractions that bring your favorite cartoon stars, comic book heroes, and story book characters to life. Go behind the scenes of this real film and television production facility and enjoy thrill rides, live shows and attractions like the Wizarding World of Harry Potter. Explore Orlando's premier entertainment destination where you can visit unique shops, watch concerts, see movies, play games, & dine at Universal CityWalk. Learn about the ocean and its precious sea life through live animal shows, an aquarium, underwater viewing stations, a cool thrill rides, and fun activities.